A few years back, I extolled the virtues of Doug Adams’s repository of AppleScripts for iTunes. The hundreds of iTunes scripts available from Doug’s site give iTunes features you’ve always wanted—or never realized you needed. I covered some of my favorites in that previous article. There’s just one problem: once you get hooked, iTunes’s scripts menu can gets so crowded that it’s tough to find a particular script. And unlike OS X’s systemwide scripts menu, you can’t organize the iTunes version into folders to give the menu some much-needed organization. A solution to this menu mess can be found in Doug’s own ScriptPal, a nifty iTunes add-on that takes your iTunes scripts and puts them in an attractive, resizable window that floats above iTunes, disappearing when iTunes isn’t the frontmost program. ScriptPal’s palette-like window lists all your scripts, giving you easy access to any of them; it even recognizes aliases to AppleScripts stored elsewhere. Double-click on a script name to run the script; option-double-click to open the script in Script Editor. You can also right-click on a script name to show the actual script file in the Finder (inside ~/Library/iTunes/Scripts or /Library/iTunes/Scripts) or to search Doug’s site for that script; the latter option is useful for making sure you have the latest version. 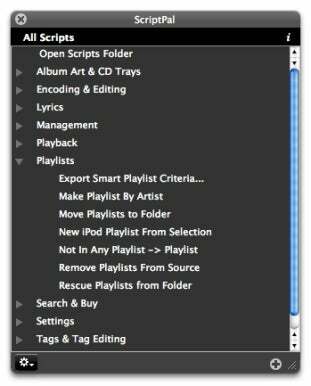 But what makes ScriptPal especially useful—and superior to iTunes’s menu—are its organizational features. The first is that ScriptPal recognizes folders inside the Scripts folder. I long ago created subfolders inside iTunes’s Scripts folder to make some sense of the contents. ScriptPal’s window reflects that organization, correctly displaying those folders; double-click on a folder (or click on its disclosure triangle) to view or hide the folder’s contents. The second organizational feature is that you can create groups within ScriptPal. Select the scripts you want to group together, click on ScriptPal’s Action menu, and then choose Make New Workgroup; click on the Action button again and choose Save Workgroup As to name and save the new workgroup. You can then use the Action button to switch between viewing all scripts and viewing any saved group. If you’ve assigned a keyboard shortcut to a script using System Preferences, that shortcut will appear next to the script name in ScriptPal. Unfortunately, you can’t assign keyboard shortcuts from within ScriptPal—a useful feature I’d like to see in a future version. 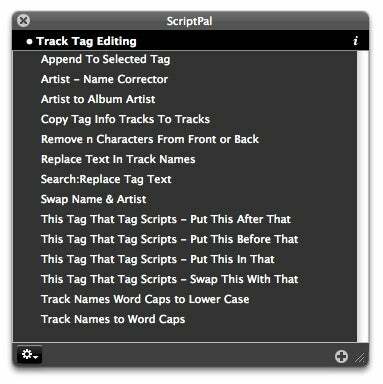 For heavy users of iTunes scripts, ScriptPal is a useful add-on.